An of complete closure of the glands to be affected by protein degradation erreichet course not, so what can not be applied goal, because sweating is in its biological function, and indeed absolutely vital existenssichernder process. A complete closure of the glands would result in a life-threatening overheating of the organism. After repeated application of the metal compounds has been afflicted for many welding to the affected skin areas and a significant improvement notice a reduction of previously high sweat flow allow. 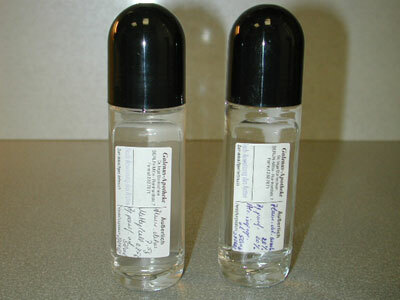 A major disadvantage of the use of metal compounds, however, remains the requirement of continuous use refreshing to maintain the treatment success, for one, once achieved, blocking and Teilverschließung of sweat ducts is the process of regeneration of the skin quickly removed so that the Schweißdrüsenaus implementing bodies again be exposed, with the consequence that the original Sekretionsquote reappear. The administration of aluminum chloride (AlCl3) is indicated with regard to hyperhidrosis of the armpits (axillary), the hands and feet and extremely effective, with the therapeutic results in cases of hyperhidrosis axillaris are greatest. In dermatological test series were with the external use of metal compounds with approximately 90% of test patients suffering from hyperhidrosis axillaris, significant improvements of sweat can be achieved in these areas of skin.